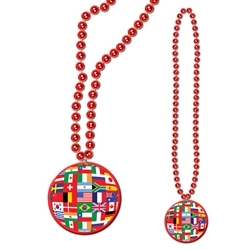 The International Flag Beads includes a set of red beads with a plastic emblem featuring flags from over 20 different countries. Show off your pride to be a citizen of planet Earth with a bead set that pays homage to countries all across the globe. From Brazil to Italy, from Canada to Japan, your status as a world traveler will be made clear with the International Flag Beads!